Just announced: There's a new video on YouTube of TV kids' host Bill Nye, "The Science Guy" in which he decries the teaching of creationism in schools. I do believe in god. But I believe in evolution, because come on, let's face it, god can do any freaking thing he damn well wants. If wanted us to be massive blobs of nothing, we would be massive blobs of nothing. He's probably trying to see what we would do with everything he has put in the universe. There's is evidence of everything really. I am not saying you should believe in one or the other. You may think everything is a coincidence, like life on this planet. But the mathematics suggest otherwise. Something did the maths when it created everything. I think i may have steered off course. Either way, there's is alot of evidence for evolution. Everything evolve. It it not true, that all we do, we try to do better than before? Even this nice webhost is still better and better. In my opinion the evolution should be mainly spiritual - we have to do things with more love, we have to find how to beter understand others... the evolution of the material universe is just hint for inner evolution. I do love seeing evolution deniers in action. I'm constantly trying to work out whether they're denying demonstrable facts through ignorance, dishonesty or just knowingly lying through their teeth. It's important to learn which kind you're dealing with because the ignorant ones may well be willing to learn why they're wrong, while the outright liars will use every fallacy, quote mine and piece of misinformation that they can find online, which is a lot. Then, when they've thoroughly embarrassed themselves, along comes another with the exact same BS. It's a very tedious process dealing with evolution deniers one by one, in the time you've spent explaining to evolution denier 1 why what they've read online is... at best dishonest, evolution denier 2, 3 & 4 have read the same drivel and are just dying to embarrass themselves by test driving it. In short then, don't make the assumption that the evolution denier you engage in discussion with, has the slightest interest in what is actually true. In this day and age of the internet where the truth is in reach, there's less and less intellectually honest evolution deniers out there, the ones you tend to encounter are not merely ignorant, they're WILLFULLY ignorant. It's ironic really, they almost always think they're defending their faith or religion, while they're actually doing it a massive disservice by trying to deny undeniable facts. There's my rant for the day! Come on! So far, evidence for evolution and against creation (correct me if I'm wrong) is nonexistent. physical design is the same. In terms of macroevolution, completely useless!! In case you haven't noticed, I don't believe in evolution. If you do, Prove Me Wrong. I do not believe in evolution. Scientists say there are many reasons to support evolution, however there are lots of things that just don't add up. Here are many reasons of why evolution is hard to believe. Louis Pasteur did experiments that proves life can only come from life – this scientific law has never been broken. How could life come from a big bang? No one has found fossils of the stages between apes and humans that have been proven. If evolution is true, it would have been happening everywhere and there would have been at least one fossil to prove it. They would have already found the “Missing Link”, if it existed. If we came from a big bang, where would our sense of right and wrong come from? What is the purpose of our life? There is no purpose if we came from a big bang. Evolutionists say how can God be eternal? If you don't believe that God is eternal you must believe in eternal matter. DNA cannot create itself. The microevolution (adaptations) in organisms we observe today are NOT evidence of evolution. Instead they are changing with what is already programmed in their DNA to better live in their environment. If DNA cannot create itself, because of how complex it is and that you need intelligence to create it then how could humans evolve from apes? Evolution would have to create DNA. seems I've exceeded the maximum quotes limit or screwed up the syntax so I'll try this another way. encody - "correct me if I'm wrong"
physical design is the same." Strange, most evolution deniers like to mention that radically different animals all have very similar DNA, as a way to suggest a common designer, yet you've said it's the opposite way around. Very interesting. encody - Also, the Fossil Record?!! In terms of macroevolution, completely useless!! The fossil record tells us numerous things, for example humans are a relatively recent kind of mammal, mammals are a relatively recent kind of animal, and animals are a relatively recently kind of life form. The exact phylogenic tree that evolution predicts is mirrored in the fossil record; there were no humans around before mammals existed, there were no bunny rabbits in the cambrian period, etc, etc. All macro evolution is is a term invented by evolution deniers to dishonestly move the goal posts. once it's proven to them that live evolves, they sneakily say "but you can't prove that life keeps evolving any more than what we've witnessed." it's about as intellectually honest as saying "you can't prove that more than 200 years have ever passed because you've only seen a fraction of it." If you look at this, it appears to be evidence of evolution... but, the fossil record has never been completely observed. Nor will it ever be, very little of what ever lived gets fossilised, nor will we find all the fossils that do exist, but we still have many hundreds of thousands of specimens, and the picture painted unmistakeably says "life has evolved." Imagine the mona lisa - having a few small details of it missing in no way means you can't tell which painting it is. The cambrian explosion was only a relatively rapid appearance of fossils from the cambrian period. Remember, the cambrian explosion refers to approx 40 million years, and life was flourishing before this period but not much of it fossilised due to lack of hard body parts, hence what appears to be an explosion only in relative terms, of how many fossils are found during and after this period. Why this any kind of problem for evolution, I'd love to know. encody - In case you haven't noticed, I don't believe in evolution. What is proven to you is partly up to you, and that's fine. Evolution remains a verifiable, testable, observable and undeniable fact, something which, if false, would have been incredibly easy to falsify, yet perhaps quite tellingly the only things the evolution deniers can do is perpetually encourage and spread the same tired old lies, misinformation, fallacies and ignorance, 99.99% of the time purely in defence of a religious belief which contradicts it. Now I have no problem with what anyone might believe, nor the reasons they do so, but on the topic of what is demonstrably true vs patently false, I'll get right into THAT discussion. Firstly, very simple self replicating matter has been produced in the lab, using processes that do occur in nature. Secondly, I fail to see why not knowing how life originated, has the slightest bearing on being very able to know that life changes over time, as indeed you'd expect any self reproducing thing, anywhere. ethanh - How could life come from a big bang? Seems an unnecessarily extreme question, in any case, I don't know. Why couldn't it? ethanh - No one has found fossils of the stages between apes and humans that have been proven. If evolution is true, it would have been happening everywhere and there would have been at least one fossil to prove it. They would have already found the “Missing Link”, if it existed. Evolution is not linear, life varies, so it branches out, meaning life on earth is one large family tree, so all living things, alive or dead, are an intermediate stage between their distant ancestors and their distant descendants, should they be fortunate enough to have any. 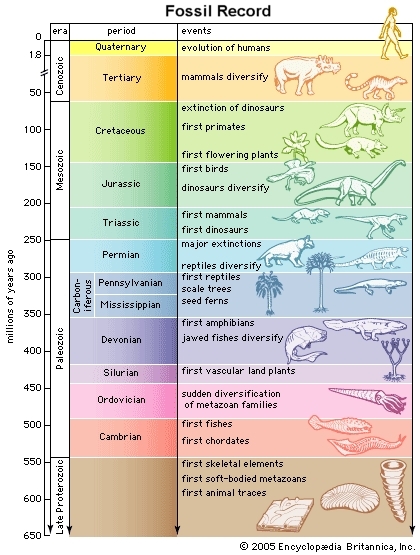 Again, this is precisely what we see in the fossil record, once there were no humans but plenty of mammals, plenty of animals but no mammals, plenty of living things but no animals, etc. As for stages between apes and humans, just as there was no humans around millions of years ago, there were none of the modern apes, but a hominid species was the ancestor of humans and apes. Think of the family tree. It may interest you to note how this misrepresentation is used to claim evolution is false. of course it's true there's no missing link between us and modern apes, that wouldn't make sense. what there IS, or rather was, is a common ancestor to us and the other modern apes. ethanh - If we came from a big bang, where would our sense of right and wrong come from? What is the purpose of our life? There is no purpose if we came from a big bang. I'll leave that question, it's clearly more about what you'd rather believe than what is true. Evolutionists say nothing of the sort, most Christians accept evolution. SOME atheists may say that. I personally don't think time itself is endless so nothing is eternal. either way, I fail to see what any god has directly to do with evolution, only the reasons people have for denying it. DNA cannot create itself. . Nothing can create itself, that's an obvious paradox. But that's not what happens, a species can diversify into several other exclusive ones purely by their variations being selected for by the differing environments they find themselves in. for example, take lions vs tigers or zebras vs donkeys, it is possible for them to reproduce sometimes meaning they share a common ancestor, however it is very rare and their offspring (ligers and zonkeys) will always be infertile, which is what you'd expect of a lineage branching out into two that are no longer compatible. Firstly, again, nothing has ever created itself. Secondly, DNA was not "created." Thirdly, plenty of complex things come into being purely by well understood natural processes, eg the solar system due to gravity, crystals due to atomic properties, etc. how could humans evolve from apes? as I said earlier, we did not evolve from apes, we evolved with apes, we have a common ancestor which was not exactly like humans or modern apes, who's lineage diversified into the species of ape alive today, us included. Evolution has "produced" DNA, "create" implies some intent to the process. No doubt DNA has not always been as complex, nor even a molecule that could be called DNA. The ancestor of DNA was probably RNA, which still exists in things like viruses, which are able to copy themselves but aren't strictly alive. Firstly, a person who believes in creation, ie a creator, does not necessarily refute evolution. Secondly, since you brought up popularity - of scientists accepting or denying evolution, there are more scientists called Steve who accept evolution, than there are scientists across the world who deny it. Ultimately though, how many people accept or deny it, has nothing directly to do with it's validity. I have, it's a constant source of amusement for the most part, as is the observation that folks clearly dig up the same old tripe there and post it on various forums, unaware that it's been pulled apart a thousand times before on other forums. You'd think people getting their info from there would want to prevent the inevitable subsequent embarassment by googling their facts first, but cleary for the majority it's about wanting evolution to be false, not about discovering what is true. I know it sounds arrogant but I do strongly advise anyone refuting evolution to decide which it is they want more; for evolution to be false, or to discover what is true. Persisiting in denying evolution publicly will almost guarantee you embarassing yourself more and more. For the intellectually honest evolution denier, www.talkorigins.org would be a good place to test creationist site claims on. I have no desire to step on peoples beliefs, but since we're discussing "is evolution real? ", that shouldn't be a problem. Great post torpex2002, I agree with all your points. It does often seem that religious people believe in what they want to be true as it comforts them as opposed to accepting -like some Buddhist philosophies do as well- that the universe just 'is'. They also like to ask us Atheists if we're ever tempted to believe in God. Sure when I once thought about it when I was 5 it seemed positive to believe in God as it meant that there would be life after death, but even then it ended up just seeming like wishful thinking to me. I suspect that many who have always believed in a personal God that's looking over them would be faced with an existential crisis if they were to seriously consider that he may in fact not exist and that it's left to you, and you only to discover what makes life worthwile, which is something they may not be capable of confronting. To answer the question what science can say about morality I suggest reading 'The Moral Landscape' by Sam Harris. A quick interview can be read here. I believe all our actions come from selfish reasons (even altruism), however that does not mean that we ultimately get our needs met by being destructive. When a friend inquired if Gandhi's reasons for serving the poor were purely humanitarian, Gandhi answered, "Not at al. Rather," he said, "I am here to serve myself only, to find my own self-realization through the service of others." There's also overwhelming evidence that we share common descent with apes. Just think of the same defunct gene we share that uniquely prevents us from producing vitame C, or that in some very rare cases a baby is born with a full tail that failed to get reabsored into the embryo as it was developing in the womb. Similarly some dolphins are born with hind legs. Very true, plus we humans still have the genes for webbed digits and all over thick body hair which, like the genes for tails, sometimes get accidentally activated. Same is true in Chickens having the genes for teeth. TBH, I find that similarities between us and other species can quite easily be claimed to be just as much evidence of a common designer as common descent, so here's something that can only be evidence of common descent, not common design. Even Darwin didn't truly understand his theory of evolution. This is quoted from his book, "The Origin of Species", pp. 172, 280. "Why, if species have descended from other species by insensibly fine gradations, do we not everywhere see innumerable transitional forms? Why is not all nature in confusion instead of the species being, as we see them, well defined? Innumerable transitional forms must have existed, why do we not find them embedded in countless numbers in the crust of the earth? Why then is not every geological formation and every stratum full of such intermediate links? Geology assuredly does not reveal any such finely graduated organic chain; and this, perhaps, is the most obvious and gravest objection which can be urged against my theory."